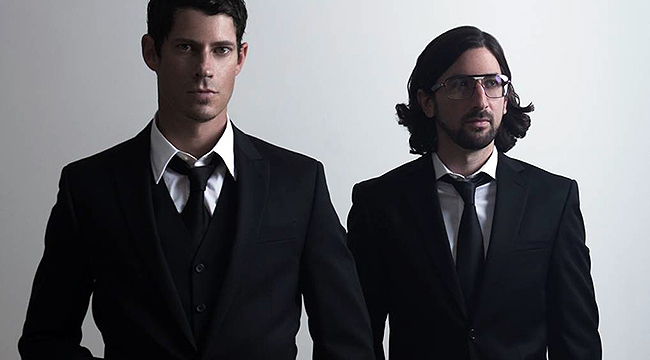 The Boulder-based electronic/jam duo Big Gigantic — saxophonist/producer Dominic Lalli and drummer Jeremy Salken — draw from a bit of everything. Their music marries funk, jazz, hip-hop and electronica. The duo has started writing material for a new album but in the meantime, Lalli and Salken continue to tour in support of the trippy Nocturnal, which they released as a free download in January 2012. Salken phoned in from an Omaha tour stop to discuss the album and the current tour, which features some terrific, mind-altering visuals. Talk about how the band first came together. It was in 2008, right? We formed in October of 2008. That was our first show. It’s right around our anniversary. I think it was the 16th or 17th of October. We met through the Boulder scene. There’s a good music scene there. We played in jazz and funk bands and met through that. We ended up living together and Dom got a laptop at one point, started making beats and now we’re here. We don’t really slow down. We wanted to do that so we can use our instruments and take solos so the set builds and drops. What made you want to combine electronic beats with live saxophone and drums? Because we had always played our instruments, we played a variety of different styles of music from funk to jazz to rock to whatever. We were homies with Sound Tribe and saw what they were doing with live instruments and a beat in the background. We were really into DJs and we thought it would be good to combine the two elements and have the set be more like a DJ set where it’s structured and flows the whole time. It has a dance element. It’s uptempo. We don’t really slow down. We wanted to do that so we can use our instruments and take solos so the set builds and drops. To what extent do you feel a connection to the dubstep scene? The EDM scene has accepted us because we do play electronic music. Some of it is heavier and in that vein. We just want to play for the people when it comes down to it. The jam band community and EDM community are kind of becoming one. There are festivals like Electric Forest that bring EDM and jam bands. They put it all together and kids just come and get down. There isn’t separation between the crowds. Talk about your use of visuals. We have a new set that we debuted at New Year’s. We call it the “waterfall design.” We’re psyched about it. It still looks good. We’re using these curved panels and they curve a different way. We have content that goes with the music. It’s becoming part of the show. We have a light guy. We retain the control. He does the designs but we tweak it with him and are very active in that process. He’ll go out and find content and we’ll okay it. We’re hands on with that stuff. Nocturnal is such a trippy album. Talk about the recording process. It’s all done on Dom’s computer. He produces everything in Ableton. All the drums are computer drums. None of them are live. None of them are recorded. When we started, we’d be on the road so much, there’s no way to record drums. The times we did try, they don’t sound as good as the ones he can make. His kickdrum is like ten kickdrums. It would be so hard to make a drum set sound that good. It’s cheaper, too. It would cost a ridiculous amount of money to record in a real studio. Plus, we give all our music away. It was easier to do that. I go in and learn the drumbeats and we talk about how to record over it and bring it to life. We play songs for three or four months before the album comes out and Dom keeps tweaking them and doing different things. Do you think you’ll ever record in a studio? I’m sure at some point. But we we’d have to take off six months just to get that time and get in the studio. We listen to everything, literally. We’re always taking stuff in. When we’re driving in the car — now we have a bus — we’ll put classical on and talk about how amazing that is. The album is so eclectic. Does it reflect your influences? We listen to everything, literally. We’re always taking stuff in. When we’re driving in the car — now we have a bus — we’ll put classical on and talk about how amazing that is. Dom will get inspired by that and by the arrangements. It’s not just about making a banging track. There’s a lot involved in it. Songs like “Rise and Shine” make it sound like you guys are into ‘70s funk and soul. Is that the case? Yeah, Dom did a great job with that album and that track. You’ve started writing material for a new album. How’s that coming? Great. We’re working on the new album right now and hopefully it will be out at the beginning of the year. We’ll play a bunch of new tunes at our shows and it will be pretty crazy.